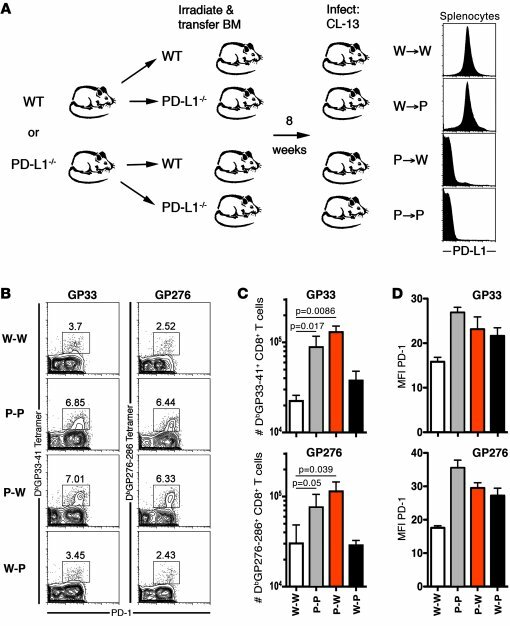 PD-L1 expression on hematopoietic cells inhibits virus-specific CD8+ T cell responses. (A) Lethally irradiated Pdl1–/– or WT mice were reconstituted with Pdl1–/– BM (P-P or P-W) or WT BM (W-P or W-W) and infected with LCMV CL-13 8 weeks later. Expression of PD-L1 on splenic hematopoietic cells was confirmed by flow cytometry. (B) GP33- and GP276-specific responses in the spleen 8 days after CL-13 infection were measured using MHC class I tetramers. Numbers above gates represent the percentage of CD8+ T cells staining positive for GP33 tetramer and PD-1. (C) The numbers of tetramer-positive cells in the spleen of chimeric mice 8 days after infection. (D) Expression of PD-1 on tetramer-positive cells from the spleen. n = 4–8 mice per group. Mean + SEM of data from 1 of 4 representative experiments are shown.